Horticulture is the profession that grows plants. This means that many horticulturalists regard themselves as professional gardeners. However, horticulture can be divided into two broad themes; amenity and commercial. Amenity horticulture is the decorative side of the profession and so involves designing, maintaining, and restoring gardens where people enjoy themselves. This can include the cultivation of turf for sport. Commercial horticulture is the growing of plants for sale. The plants grown can vary from potted nursery plants to for cut flowers, and through to wine grapes, vegetables and herbs. Who can become a horticulturalist? A very wide range of people make their living as a horticulturalist, because horticulture covers a wide range of activities. It is common for people to start their career in the more physical and active parts of the profession, such as garden construction & maintenance, and then finish in a more supervisory or advisory area such as landscape design. However, there is a rich and proud tradition in horticulture for the employment of people whose lives have become temporarily derailed or who have always had to cope with a disability. 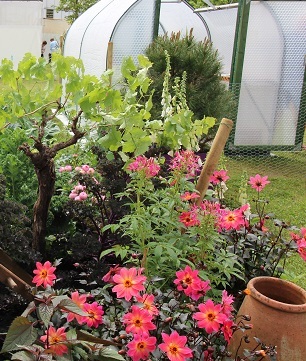 Horticultural therapy has provided life-changing support for many people in this position and horticultural therapist are always in demand. Anyone who is interested in a plant can become a horticulturalist of some description. How do people become horticulturalists? There are two very clear ways that most people come into the horticultural workplace. Firstly, there are those of us who started gardening with a parent, or grandparent, who decided from an early age that this was the life for them. Alternatively, there are those who come to it much later in life when they have become disillusioned with sitting all day in front of the screen of a computer, or behind the wheel of a vehicle. The career changers make up a significant proportion of the profession. At the heart of horticulture are the practical hands-on skill of cultivating plants. Thus, for many people, getting a job as a gardener or nursery assistant is the first step. But very quickly, most of us want to learn more, and this is where distance learning is so perfect. Many, many professional horticulturalists develop their careers by studying in the evening after work and ACS has a plethora of courses to support your career. How can ACS help me start and develop my horticultural career? The horticultural courses were the first developed by John Mason. They continue to be updated regularly to keep up to date with all the new innovations and information in horticulture. If you already know that you are interested in learning more about turf, the entering this in the search function will take to straight to the many courses that deal with turf care. We have courses for the absolute beginner through to the senior professional. View all horticulture courses here or click here to contact one of our horticulture tutors with your questions.